Ideal, complete and yet compact camper. 4 persons, spacious round seat behind, can also be used as a bed and a double fold-down bed. Toilet with separate shower room. The air conditioning in the living area works on 12V and can therefore also be used while driving. There is also a built-in oven. 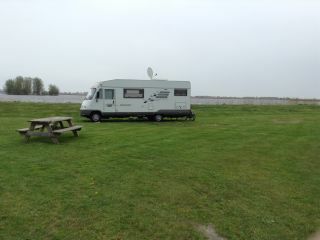 Garmin navigation with campsites, camper pitches, pumping stations etc. 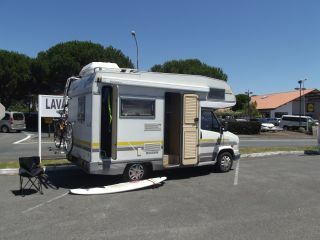 The camper is also ideal to go with 2 people, also to regions where it is not always nice weather. Behind delicious round seat and for the spacious lift bed; so if you are with 2 people you do not have to change the bed every night. TV and DVD player on board. Rear bike carrier for 2 bikes. Possibly a small pet can join the camper; this in consultation. 2.8 Tdi diesel with 128 HP. We ourselves sparingly with our stuff and expect this from people who want to rent the camper. Of course, carefully handle the camper. Maximum speed 110km / h, no smoking. Small pets can also come along with you.